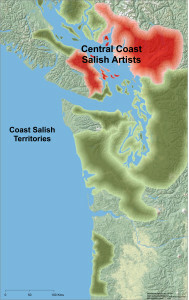 The map below shows Coast Salish territories in green. Red highlights the areas the artists represented on this site come from. Note: an area of Northwestern Oregon is included in the detail. 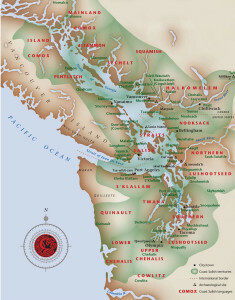 The map below will of course fit into Social Studies lessons, but how about Language Arts? Anyone up for a unique spelling test? Classrooms within Coast Salish territories may be surprised at how many Salish place names are in everyday use.